Fidel called in to Hugo Chávez’s radio show “Hello President.” The BBC has an edited (and translated) transcript. A big chunk involves praising each other (Castro tells Chávez, “you will be one of the greatest writers in this hemisphere”). They also debate who studies and reads more, and even who has partied the most (says Chávez, “I never partied as much as you”). I couldn’t help get the sense that it was like two boys at a slumber party. I wonder how true that generally is of close allies. For example, it’s hard to picture Kim Il Sung and Mao hamming it up, or Reagan and Thatcher giggling with each other. One further note. In the call, Castro also says, “I feel good and I’m happy.” In other words, it appears he’s still not dead. Rubén Rumbaut and Walter Ewing have published a thought provoking study on immigrant assimilation in the U.S. Conventional wisdom suggests that recent immigrants are likely to commit crimes. They are young, predominantly male, poor, and not well educated, so we assume they are more dangerous. Empirically, however, this is not true. As they demonstrate, crime rates have decreased even as immigration has increased (and the patterns hold over the last three censuses). In addition, the foreign born population is much less likely to commit crimes than the native born. In fact, the least likely groups from Latin America to commit crimes are foreign-born Mexicans, Salvadorans, and Guatemalans, who are precisely the people cited in the media as being more of a problem. They are the least educated, yet also the most law abiding. The NYT reports on Hugo Chávez’s recent travels, as he attempts to become a major donor in the region and supplant the U.S. as the major influence. I disagree with Steven Taylor at Poliblog about whether aid necessarily means that a country will act in accordance with Chávez’s will (he uses the term “client state"). Influence only goes so far, as the UN vote demonstrated, and in some cases (like Bolivia) Chávez is often facilitating rather than directing. At the very least, we would need to see Chávez trying to get a president to do something he/she otherwise would not do to determine his independent influence. Along these lines, he has learned well from the United States. If you don’t like something another country is doing, then punish it by taking out your investment. Chávez did so with Costa Rica because President Arias criticized him. But would he threaten to turn off the oil spigot if Daniel Ortega does something he doesn’t like? From Tim's El Salvador Blog: last year El Salvador passed an anti-terrorism law, and now it has been applied to arrest the leader of street vendors in San Salvador for his role in protests that turned violent. This means he will lose many normal rights, with anonymous witnesses, harsher prison sentence, etc. There's nothing like vague laws in the name of the "war on terror" that can be applied to anyone at anytime for any reason. The NYT has an article on Venezuela’s military spending and arms build up (which I’ve briefly noted before) and it does a good job of explaining the views of both proponents and opponents. Even for Chávez supporters, however, it is hard to imagine anything positive about the massive amounts being spent. Especially with the internet, there is more access to baseball statistics, and people are always finding new ways to manipulate them. A new one making its way through the blogosphere is pretty funny: the Suckage Index. It was created by Batter’s Box for pitchers, but now has been applied to hitters. Geoff Young at Ducksnorts shows the calculations for the worst Padres hitters in history in a single season. The worst ever, by far, was Ozzie Smith in 1979, with a Suckage score of 21,417. Too bad that the guy we traded him for, Garry Templeton, had the third worst in 1987. This article, like many others, could just as easily be “U.S. Fails to Offer Any Alternative to Chávez.” To counter the idea that U.S. influence is waning, Assistant Secretary of State for Western Hemisphere Affairs Thomas Shannon replied that two-thirds of economic output in the Americas was covered by free trade agreements. If your definition of influence boils down to whether you persuaded a country to join up with an FTA, then you need to do some more thinking. In the face of proposals to open up more to Cuba, the Bush administration trotted out Commerce Secretary Carlos Gutierrez to announce that no changes to Cuba policy would be acceptable. Discussing contacts in terms of weakening the Castro government is missing the point. Instead, the question should be whether refusing to make contacts has hurt the average Cuban (not to mention U.S. businesses) while strengthening the Castro government. It seems more naïve to argue that a strategy in place for over 40 years can still be considered functional even though it has not achieved its stated goal. We negotiated with the Soviet Union, even more famously with China, with Vietnam, and just recently even with North Korea (though its nuclear capabilities obviously had a lot to do with that). But with Cuba we’re stuck permanently in the early 1960s. Eisenhower got the embargo ball rolling—I don’t think U.S. policy toward many other countries dates back to Ike. ...the armored car industry in your country is having a record year. "This country is already among the top three markets for armoring in North and South America. Armored cars are here to stay," said Esteban Hernandez, head of Mexico's association of armored vehicle producers. With dozens killed in drug gang-related violence each month, the association predicted Tuesday that 2007 would be a record year, making Mexico one of the world's top markets for armor-plating cars. Last month, Adam Isacson at Plan Colombia and Beyond wrote that General Peter Pace, chairman of the Joint Chiefs of Staff, claimed that the U.S. counter-insurgency and anti-drug campaign in Colombia was a good model for Afghanistan. Why would any serious person - much less the top-ranking military officer in the United States - view Colombia's experience as a model to be repeated anywhere else, much less a country - like Afghanistan - that is several degrees poorer and less governed than Colombia? Very good question, as the “war on drugs” in Colombia is clearly being lost. Coca cultivation is stable (or even increasing) while the use of herbicides is being decried, violence is widespread, and distrust of the government in rural areas is rife. All the while, the guerrillas are as strong as ever. Fast forward to this month, as the first group of Afghan police have arrived in Colombia to learn the best ways to lose a drug war while also alienating the local population. I’ve often criticized the U.S. media for its portrayal of Latin America. I just read an article in Newsweek International, feeling the same general annoyance at the oversimplification and over-emphasis on the power of Hugo Chávez, then suddenly realized it was written by Jorge Castañeda. He is a very well known political science professor (I liked his book Utopia Unarmed) and former Foreign Minister of Mexico. In short, the article attributes much of recent Latin American political change to Chávez in ways that defy common sense. The main hypothesis is that Chávez helps other countries, and as a result the presidents of those countries concentrate power and damage democracy. I’m always uncomfortable with analyses that ignore domestic politics this much—does someone like President Kirchner really just respond to Chávez? Further, does Chávez really wield that kind of power? Last year we saw the limitations of doling out oil money, as he could not garner the necessary votes to win the Security Council seat. What I do agree with is Castañeda's argument that the Bush administration’s refusal to play a positive role in the region encourages Chávez and offers no alternative vision of the future. All the U.S. does is repeat the free trade mantra ad nauseam, while proclaiming the need to build a big wall to keep Latin Americans out. 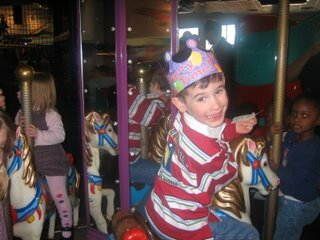 My son Ben turned five today, and for the second year in row--at his request--we invited a bunch of his preschool friends to Chuck E. Cheese's. His face says it all. Just the other day, I was joking about Cuba trying to get its own search engine to avoid the imperialist evil of Google. In fact, they just unveiled one, called Dos por Tres and anyone can give it a whirl. The catch, of course, is that you can only access approved Cuban government sites. There is a huge bonus, though, in a special feature that allows you to search through a huge electronic database of Fidel speeches. When I did searches, the results were mostly from Radio Habana. So, for example, after typing “Fidel salud” (Fidel health) the first result was news that “important Guatemalan personalities” hoped for Fidel’s recovery. I typed in “Bush” and the first result was from the website “Cuba Socialista” and entitled “Bush’s re-election and the Cuban counter-revolution.” Exciting stuff. I also learned that the Cuban government has a website dedicated entirely to Elián González. Finally, I had to take a look at the speech database, but unfortunately it seemed to offer the exact same results as any of the other categories (general, images, press, etc.). It’s still a beta version, so we’ll have to wait. Both Boz and Ka have noted the fact that a Saudi branch of Al Qaeda has called for attacks on suppliers of oil to the U.S., including Mexico and Venezuela, and how this confuses the antagonism between Presidents Bush and Chávez. In fact, it seems to be confusing the Chávez administration. One of his military advisors was quoted as saying it was illogical that “al Qaeda, which is against North American imperialism, would go against a state that is fighting, though in a different way, against that hegemony." A Venezuelan lawmaker claimed that the U.S. was the source of the threat. I think what we’re seeing here is the limitation to the “enemy of my enemy is my friend” foreign policy that Chávez has been pursuing. We hear all the time about insidious Middle Eastern influences in Venezuela, most notably Iran, but the common strategic interests are almost nonexistent. Although Chávez may like to think he is emerging as the leader of an anti-U.S. policy camp, Al Qaeda has every reason to distrust him because for all his rhetoric, Chávez helps keep the U.S. economy humming along by exporting oil and continuing to invite capitalist investment even as he begins nationalization in some sectors. It is currently 34 degrees here in Charlotte, but pitchers and catchers are reporting to spring training today. It's a more effective indicator than a groundhog that spring and baseball season are not too far off. I read and recommend Gabriel Thompson’s There No José Here, and I’ve put it on my sidebar. I especially liked it because it offers a wide ranging, warts and all view of Mexican immigration to New York. He is obviously sympathetic to Enrique, the focus of the book (they are close friends), but does not paper over the problems of young pregnancies, child rearing, machismo, etc. It even includes a trip to the small Mexican town where Enrique came from. In another example, the author walked right into a sweatshop where Enrique’s wife worked. They were paying less than minimum wage, in truly horrible conditions, but the owners had no fear. I suppose this was a combination of knowing illegal immigrants were not likely to complain, and that the city wouldn’t do anything about it anyway. Why does Cuba limit internet access to its citizens? Because of U.S. imperialism. Furthermore, says Cuba’s Communications Minister, we need to control “the wild colt of new technologies.” You know, that newfangled internet thing, which is just a series of tubes. He noted that the U.S. has blocked Cuba from connecting to fiber-optic networks, and that Google and Microsoft are tools of the empire anyway. To deal with the former, Hugo Chávez promised to lay a cable between Venezuela and Cuba. To deal with the latter (where he has a valid point in terms of giving the government information about what people do online), Chávez should use some oil money and create a Bolivarian Search Engine, which could prevent people from accessing counter-revolutionary sites or supporters of Mr. Danger. The Chávez government is preparing a decree to give the government control over food distribution if shipments and sales of food halt. There have been serious problems with shortages and a thriving black market. Keeping the price of essential food items reasonable is no easy task. Where poverty is a serious problem, it is entirely reasonable for a government to enact laws to address the issue. But as I’ve been reading news about shortages, supermarket lines, hoarding, and the black market, and then the government’s ad hoc reaction, with a patchwork of new laws, accusations, police raids, combined with chronic mismanagement and corruption, one thought really came to me. The “revolution” in Venezuela was supposed to be different, a dream of 21st century socialism that learned from its 20th century predecessors. But this particular pattern is one that has been followed many times in Latin America; it is the same old story. Where is the new, improved, carefully crafted plan? I’d be so much more apt to listen to President Chávez if there was just something new. Something original. I haven’t seen it yet. The L.A. Times has an intriguing story on a California town, Lindsay, that is struggling to persuade its Mexican immigrants—many of whom are undocumented—to stay. Desperate to have the necessary labor to pick and process oranges, the town is promoting local projects to provide employment when the season ends. The recent freeze meant fewer oranges and less work, thus putting pressure on those immigrants to find more stable jobs elsewhere. "It helps all of us," said 71-year-old Bill Martin, who owns a tire shop in town. "I don't particularly care for illegal people in the U.S., but if they come in and want to buy a tire, I'll accommodate them. If you don't have people come, you won't get the fruit picked. And if the fruit doesn't get picked, nobody will have money to buy anything." Not long ago, a high school student here recited the Pledge of Allegiance, then was asked if he would say it in Spanish. He did so, and a controversy was born. One parent in particular took up the English-only banner and today published an opinion piece in the Charlotte Observer. It really must be read to be believed. Here are some highlights, and rest assured I am not making this up. We ran the Homecoming 5K this morning, which was very cold. I won first place for male faculty/staff (it should be noted, however, that my time would've put me only fourth for female faculty/staff!). I am, in fact, not exactly sure how many other male faculty/staff participated. Thanks to several of my students who were volunteering on the course and cheering everyone on. In anticipation of President Bush’s planned trip in March to Latin America, Undersecretary of State Nicholas Burns made some statements about U.S. policy. "You will find our government is very ecumenical. We deal with left governments, center governments, right governments," he said. As for "the far-left radical governments of Cuba and Venezuela ... that's another matter." I had a nice lunch downtown today with Michelle, even though because of timing we were accompanied by my daughter, Julia. At least as two year olds go, she’s not too crazy. Aside from taking a packet of Splenda and asking me to pour it in her milk (which I refused) and eating primarily from my plate, she did OK.
We chatted about Latin American fiction to use in class. In a class on politics, we want something that is accessible, not massive, and which addresses political issues in some interesting way, while also available in English translation. It’s tougher to find than you might think. Thanks to my friend Mike for pointing out this story, which actually ran in the travel section of the NYT. In central Mexico, at the “Parque Eco Alberto,” there is an illegal immigrant theme park. For $18, you pretend to be someone trying to cross into the United States. This means an actor playing the coyote, others as the Border Patrol (complete with guns shooting blanks), etc. It is run by the Hñahñus, a Mexican indigenous group (many of whom have emigrated themselves) and was started up with financing from the government. It attracts mostly Mexican tourists. When the smell of gunfire dissipated, we sneaked away, crossing cornfields, passing drowsy mules and slipping under barbed-wire fences. Brown moths darted in and out of the flashlight beams, and the guides philosophized about the significance of the hike, the empathy it aims to teach. The article points out that Doctors Without Borders has set up tent camps around the U.S. to show people what a refugee camp is like. But that example seems less participatory. In this park, you are pretending to be an immigrant, which is actually extremely dangerous in real life. Doctors Without Borders, for example, would not likely ask people to play the roles of Sudanese refugees. Is it really consciousness-raising, or just for tourists who believe it would be exciting to playact a dangerous situation without fear of real risk? Despite its longevity, the Brazilian dictatorship (1964-1985) gets far less attention than its South American counterparts. In large part this is because fewer people were killed. An amnesty was put in place in 1979, but unlike Argentina and Chile, it was not challenged. Until now. A married couple was arrested and tortured in 1972, and now are suing the retired army colonel they say is responsible, arguing that the amnesty prevents only criminal, not civil, charges. A state judge accepted that argument and so the case can go forward. As a side note, a great idea would be to analyze the ways in which amnesties are interpreted years after they are established. This could have major repercussions, as there are former guerrillas in Lula’s administration who could potentially also be sued. As the article points out, Lula never brings up the issue of human rights during the dictatorship, or at least I haven’t read about him doing so. I just finished listening to Doris Kearns Goodwin’s Team of Rivals, which focuses on how Abraham Lincoln named political rivals to his cabinet after winning the presidential election. Salmon Chase, for example, believed—as did many others—that Lincoln didn’t have what it took to deal with the country splitting apart, but was still named Treasury Secretary. Chase even wanted to challenge Lincoln in 1864. There’s nothing exactly “new” but the central theme is still interesting. Goodwin’s main focus is Lincoln’s amazing ability to manage his political team, and she does successfully convey how incredibly difficult the job was, and how he was able to engage people who were skeptical or even highly critical of him. Some, like Edwin Stanton, eventually became very close to him personally. Lincoln sought to balance different factions of the Republican party while also getting the most effective people for the cabinet positions. The narrator is Thomas Richard, who also read Manhunt, and I think he did a better job with this book. I am fortunate to have a very short commute, but at times I’d get into it and wish it was a little longer. I added it to my sidebar. I want to use baseball as a medium for exploring the complex dynamics that accompany cultural exchange. For my project, I will immerse myself in various international baseball communities across Latin America and the Pacific Rim, where I will seek out, observe, and engage baseball players, fans, coaches, and scouts wherever I can find them. Baseball's expansion mirrors the process of economic globalization in many ways. The game of baseball is an accessible and meaningful way to examine the deeper cultural implications of this process. The AP has a story about the U.S. air base in Manta, Ecuador. President Correa has made very clear that he does not intend to extend the lease when it expires in 2009. The article really makes a point of criticizing him for doing so: if planes avoid Ecuadorian airspace and bring in some money to the local economy, why would a government begrudge this key element of the U.S. war against drugs? Aside from the fear of the Colombian conflict continuing to spill over into Ecuador (a problem the article does at least mention) the answer is strikingly simple. Maybe, just maybe, some people don’t like having foreign soldiers stationed in their country, doing work based on a different country’s definition of national security. How many Americans would accept a Mexican military base in Texas to address organized crime in Ciudad Juárez? A Salvadoran base outside Los Angeles to keep tabs on gangs? At the very least, we should start with the assumption that foreign bases are not our right. Over the past several years, both Hugo Chávez and Fidel Castro have trumpeted the loan of Cuban doctors to treat the poor in Venezuela. The Associated Press has an article highlighting the plight of the doctors themselves. The couple said they were forced to work seven days a week for little pay in the countryside near Caracas, and their relations with Venezuelans were tightly controlled. It’s estimated that some 500 Cuban doctors (out of a total of about 20,000) have defected from Venezuela in the past two years, and currently there are 38 stranded in Colombia, hoping to achieve refugee status in the U.S. Meanwhile, last year the Bush administration created a new policy--the Cuban Medical Professional Parole program—to facilitate the entrance of Cuban doctors. For reasons unknown, these doctors in Colombia have been denied entrance. This underlines how our immigration policy toward Cubans is ad hoc, bizarre and unpredictable. Actually, I suppose that describes our immigration policy toward most other other countries as well. The next time you read about the Latin American left (most recently, we were informed that there is a "left-wing surge" in the region) consider Nicaragua. There it appears that being leftist means talking to the richest people in the Americas to get their investment while proclaiming your commitment to the business sector. In short, with a 3/5 vote the National Assembly can delegate decree power to the president. It is within the constitution. Being constitutional, however, is not the same as being democratic. By far the best analysis of this is Brian Loveman’s The Constitution of Tyranny. “States of exception,” a concept borrowed largely from revolutionary France, have been part of Latin American constitutions from the beginning. They are undemocratic, as they allow for extraordinary powers, thus stripping citizens of their rights and giving the executive carte blanche to go after political opponents. The Senate has been more open to the president’s immigration proposal, yet now has added an amendment to the minimum wage bill that is a) poorly thought out; and b) likely to make House-Senate negotiations on the bill more difficult. I suppose it was a way to get a few extra Senate votes. The amendment punishes any company that hires illegal immigrants by banning them from federal contracts for 10 years. Sounds straightforward—who would quibble with enforcing the law? The problem is that this is putting the cart before the horse. Right now, the federal government does not keep adequate track of people entering the country. This amendment puts the onus on companies to enforce federal immigration law. The government needs to start by developing a database that keeps track of immigrants. This will be both extremely complex and expensive, which is likely why no one is yet bothering to try. I think there is increasing convergence on all sides of the immigration issue on one point: the federal government is really not making any serious effort to take responsibility, and instead is leaving it to businesses and local governments to enforce laws about which they have no input. Immediately evident is that Marcos has a great sense of humor, which surprised me. There is a lot of discussion of the plight of the poor, but interlaced is a sometimes hilarious cast of characters, from a transvestite turned revolutionary, to a guy who dubs the voice of Barney into Spanish. Marcos himself is in the novel, and he writes about himself in the third person in a way that seems perfectly natural. Also interesting is that the two authors don’t view the world in the same way. In his novels, Taibo’s main character always shows his love of Mexico City, even as he recognizes its shortcomings. Marcos and his characters simply refer to the city as “The Monster.” Every politician in The Monster is viewed as corrupt, including López Obrador. Taibo’s character, meanwhile, has no interest in revolution. But they all agree that there is too much evil and corruption, and this creates a bond between them. The law of the budget is to take your fill: if you don’t steal it, someone else will (p. 149). You have to understand: evil has its levels. There are those who screw the screwed, and there are those who screw the screwers of the screwed (p. 176). The plot can sometimes be hard to follow, and jumps around—it centers mostly on tracking down a shadowy figure named “Morales.”. Nonetheless, I really liked the ending, which I won’t explain because I would give it away.